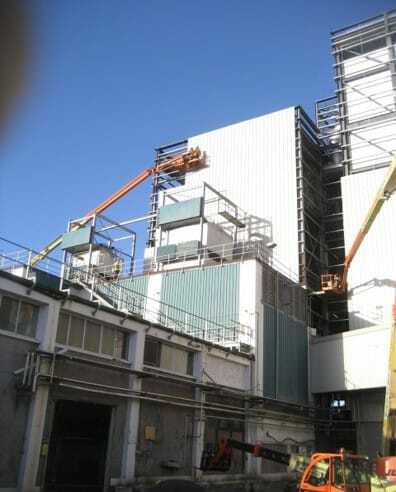 Kerry Ingredients – Duggan Brothers Ltd.
Dryer Tower Extension – Steel Framed building with a ground floor area of 350 sq.m and height of 39 metres. The building incorporates suspended floors / plant access platform at various levels all supported on steel beams. The floor / access platforms include a suspended concrete floor at 5.3m and other floors at upper levels through the building constructed in stainless steel chequer plate fixed to steel building. 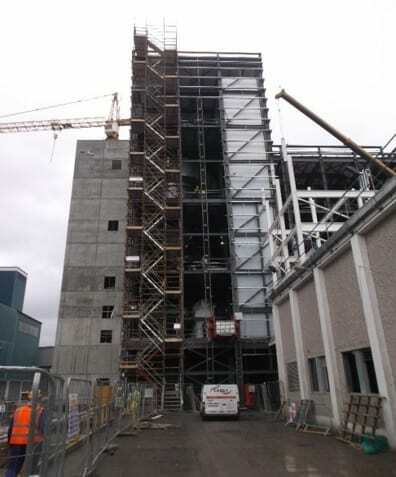 A 39m high in-situ reinforced concrete stairwell / lift tower enclosure was also constructed adjacent to dryer tower and fitted with steel stairs and landings. Works consisted of upgrading of existing warehouse to accommodate new bagging line facility. The works entailed part demolition of existing warehouse, installation of new piling & foundations and upward extension of the warehouse to create penthouse plant room. Works required include the extension of and refurbishment of existing building to accommodate a new reception, extended changing room and office accommodation.